Tour Highlights : Le Mans car motorsports Museum, Normandy landing beaches, Mont St Michel, pink cliffs of Perros Guirec, historical Theme Park of Puy du Fou, Castle of Chambord, fishing harbour of morlaix and Honfleur. Loire Valley castles. We will make our way from Tours to Normandy and make a stop at the mythic circuit of the 24 hour race of Le Mans where we will ride an actual portion of the road course.We will pass some typical villages of Normandy, well known for their half-timbered houses, and stop at the Basilica of Lisieux, home of St Teresa. We will arrive for the evening in the 18th century harbor town of Honfleur. This will be D-Day revival day. We will stop at many major sites where this historical event took place, from the English beach of Juno and its famous Pegasus Bridge, to the breathtaking beach of Omaha and its heart-rending cemetery. Utah Beach and the Village of Ste Mere Eglise will be our final stop of the day. This was the first village liberated by the 101st Airborne Division. We head through the countryside of Normandy toward the famous Unesco site of Mont St Michel. We will tour and have lunch at this famous monastery and then make our way to the seaside city of St Malo, a fortified town of seamen and corsairs where the discover of Canada, Jacques Cartier, was born. We are now in the region of Brittany, a Celtic region of tradition and independence. After a stop to visit the narrow medieval street of old town Dinan, we will follow the wild coast of Brittany from the Frehel cape to the pink rock granite coast of Perros-Guirec, then, through the fishing harbor of Morlaix we will reach the mysterious moor land of the Mont d’Arrée. Wilderness and tradition are the key words pf this day of ride. We enter the heart of Britany and stop in Auray and one of the most beautiful village of France: Rochefort en Terre. Then through the salted marsh of Guérande we will reach the seaside resort of Le Croisic. Few miles today to reach the Park of the Puy du Fou for an entertaiment day this historical theme park. This park was named best park in the word by the Thea Award several times. Here you can relive the major periods in the French history from the Roman Empire to the 20th century. Fun and culture combined for your pleasure. Today the castle of the Loire Valley welcomes you. You will discover some the most famous medieval castles region: Montreuil Bellay, Brézé, Saumur and of course Chinon overlooked by its impressive fortress. On this last day of the tour, we will enjoy the iconic castle of the Loire Valley, Chateau Chambord. This amazing chateau is the most visited castle in France aster Versailles. Our route will bring us back at Tours by way of some lesser known, but nevertheless majestic, castles. A farewell dinner in old town Tours will end this great journey. History and traditions are the key words for this motorcycle tour. History, traditions and legends merge to charm you with each of your stops. Alternately, you will succumb to the enchanting atmosphere of the moors of Brittany and the Nomandy hedgerows. Enjoy a glass of cider, and some creamy Camembert cheese sitting facing the harbor, watching the old riggings. Then you will cross the Road of Freedom in Ste Mere Eglise and you will walk in the footsteps of the liberators at Omaha Beach. 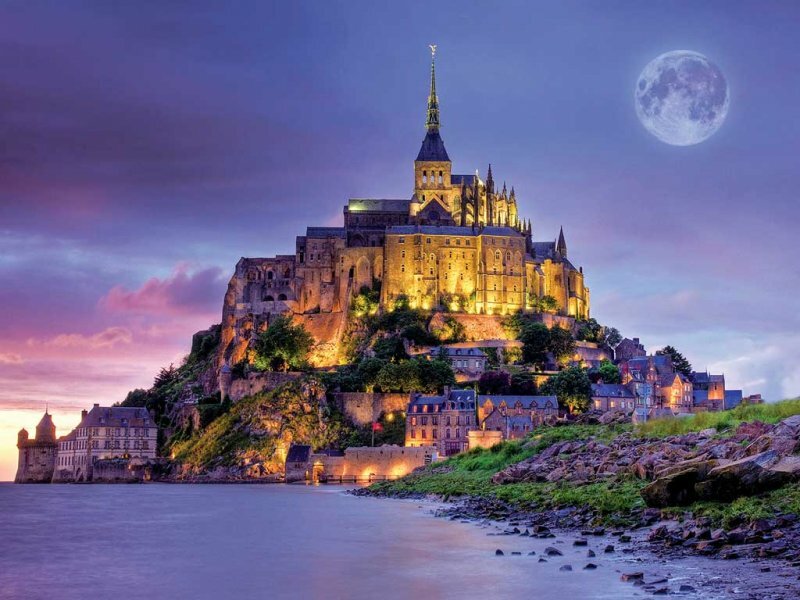 You will be amazed at the sight of Mont St Michel, a Unesco World Heritage site before diving into the history of France at the Puy du Fou Theme Park, awarded World's best Entertainment park in 2012. We will the visit several chateaux of kings of France on the banks of the Loire valley. An excellent opportunity to sip some sparkling Vouvray or red Chinon wines and bring back with you a little of the French soul. Entrance tickets to Le Mans motorsports museum, Omaha Beach museum and the historical theme park of Puy du Fou. Tour information package with road-book and travel tips. Discount applies on single room rate for one rider sharing room with other rider.